On April 16, 1917, the United States entered WWI. A month later, in an effort to supplement food supplies, UNH faculty members were growing potatoes. Actually, it wasn’t UNH back then; it was the New Hampshire College of Agriculture and the Mechanic Arts, and the faculty was called upon to “put into practice what they were teaching.” Twenty-eight men responded and the “Factato Club” was born. Their first official meeting was May 19, 1917. Club members were summoned to appear at Morrill Hall to cut seed potatoes for planting. “Bring bucket, paring knife, and a cheerful disposition,” the notice instructed. It was signed ‘Very truly, F.W. Taylor, Factata, by O.V. Henderson, Factortum.” Taylor was then dean of the College of Agriculture. The following week, 17 members of the Faculty Potato Club helped plant the seed tubers on the acre and a half of land west of Thompson Hall (now the site of the tennis courts). One professor was said to have worried about covering the potatoes because he thought they would get dirt in their eyes. That’s a true accounting, according to the May 26, 1917, edition of The New Hampshire. The student paper reported that during that first planting, Pete Henderson and Coach Cowell, who had been on fertilizer duty, had to eat their supper in the woodshed. Two other faculty members, referred to as Wolfe and Porter, were ordered off the field because they wouldn’t stop talking. Someone named Ritzman was docked two hours because he kept stopping to fill his pipe while “Pa” Taylor sat on a rock and sang “Let Phosphate Scent the Breeze in Growing Potatoes and Early Peas” as the men worked. Around 10:30 on the morning of the harvest, the potato club members lined up for inspection by President Ralph Hetzel who declared they were in “fine condition and well trained.” After photographs were taken, 177 bags of potatoes were loaded into wagons. During the process it was learned that two of the faculty members had added rocks to the bottom of their bags when they heard the potatoes were going to be divided by weight. Nature, kind mater, will aid us in our need, down with the tater, up with the weed! The first year, the Faculty Potato Club harvested 260 bushes. Shares sold for $2.25 and bought about five bushels. 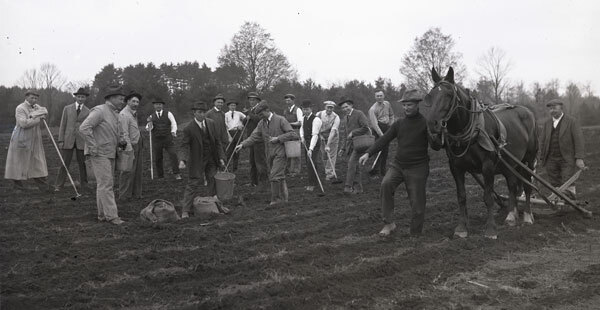 The following spring, the potato patch was enlarged to two acres and a several new members were added to replace those who had “proved themselves unqualified” the year before. 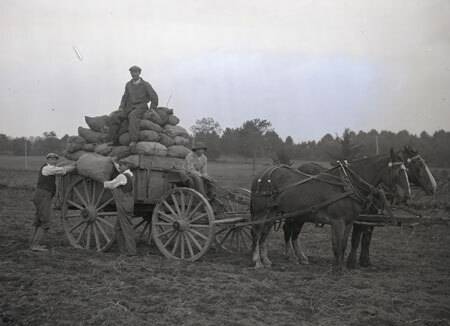 Before the season began, a set of regulations were drawn up that included the prohibition of cutting seeding potatoes into French fries, and putting stones in the bags during harvesting. Despite an August blight, the yield was increased to 324 bushels.